Players are winning majors later than they have in decades. We went into the U.S. Open with two veteran favorites, and we end with two veterans winning — just not the ones we were expecting. Angelique Kerber won her second major of 2016 and took the world No. 1 ranking from Serena Williams, at age 28. This makes her the second-oldest woman to win a second major in the open era — behind Li Na — and easily the oldest to do it in so short a time. For all the praise Williams and Roger Federer have (deservedly) received for staying at or near the top of their sport, the contending tier of tennis has been welcoming veterans more and more over the past couple of decades. Here’s a plot showing all the new major winners from 1980 and how old they were when winning their first majors — up to three. The ATP had Mats Wilander and Boris Becker win multiple majors as teens in the 1980s, but before Wawrinka and Murray the typical age of a “first three” major winner ranged from 22 to 24 years old. The WTA has been more dramatic. 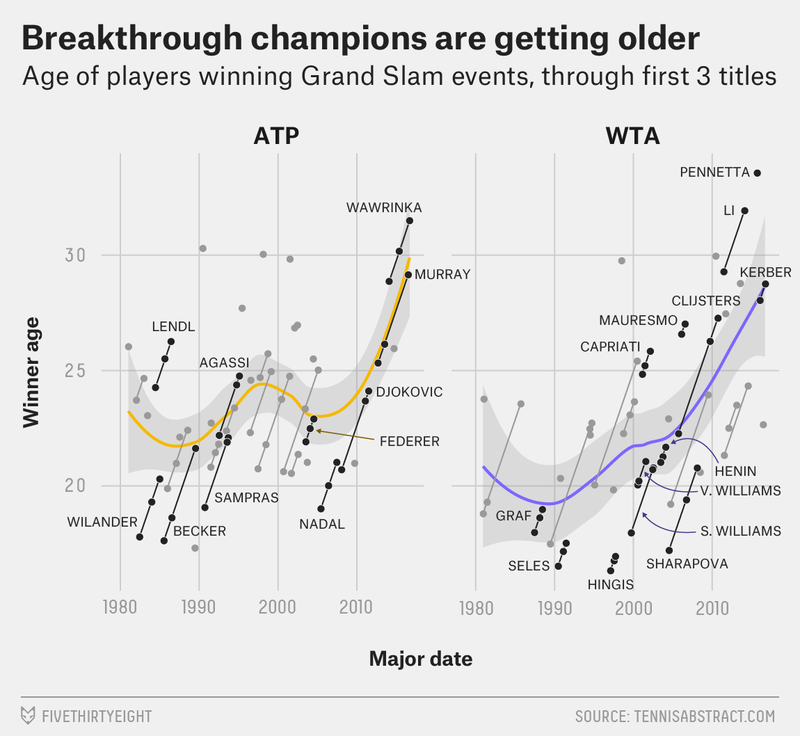 In the late ’80s and early ’90s — led by young sensations Steffi Graf and Monica Seles — the average “first three” major winner was a teenager. In 1997, then-16-year-old Martina Hingis exploded on the scene by winning three Grand Slam events in the year. Since then, the “teen sensation” has virtually disappeared entirely, giving way to “early 20s sensations” like Venus and Serena Williams and Justine Henin, and even the “late 20s sensations” like Jennifer Capriati, Kim Clijsters, Amelie Mauresmo, and now Kerber. Since 2010, there have been nine majors won by “first three” winners over age 25; in the previous 30 years, there were only seven. What exactly is causing this phenomenon is unclear. The lack of a young next generation of tennis superstars may be giving older players more chances to break through. But it’s also plausible that the sport itself has matured — for example, younger players may not have the same physical advantages over older ones that they once did, as all the top players are now tremendous athletes — to the benefit of more honed and experienced players. John Newcombe, Ken Rosewall and Rod Laver all won slam events prior to the open era, and before age 25.